Dallas here. Betcha missed me, right? Recently, the dog-walking service called Rover contacted Mama, suggesting she write a post on the etiquette of dog-walking. Huh, like a human knows anything about that! Use a leash. Unless you’re in the middle of a desert or a cow patch, snap a leash on your dog. Some folks are afraid of dogs; besides, you don’t want to watch us race into traffic and get run over, do you? Keep us tethered close. I hate when dogs attached to retractable leashes roam far and wide. There’s a reason those leashes lock, and it’s so your pooch doesn’t have to be in my business if I don’t want him there. Nor does Mama or some unsuspecting bicyclist want dogs jumping on them. Vaccinate your dog. I’m finicky about germs. Mama keeps me healthy, and I don’t want your dog giving me kennel cough or some other crud. If your fur-pal isn’t well, keep him home. Greet others warily. For all you humans who say Fido doesn’t bite — he’s got teeth, doesn’t he? That means he can bite. Whether he chooses to isn’t up to you. Don’t force us to interact and don’t touch me unless Mama says it’s okay. Watch your kids. If you’ve got little kids, don’t let them race from their front porch to a passing dog — even if they “know” that dog. Dogs view such behavior as threatening. Teach kids to be calm around dogs and keep their hands away from our mouths. Pay attention. I’ve had other dogs growl at me, bark at me, and lunge at me…how rude. Mama has gotten rope burns — and even been knocked completely over — when some other dog’s leash wrapped around her legs. We’re excited to be out on a walkie; it’s up to you to contain our enthusiasm. Scoop. This stands to reason, you know. We dogs can’t pick up after ourselves (no opposable thumbs). We count on you humans to carry a bag with you and use it. Especially since we usually prefer pooping in the Yard of the Month…while the owner is looking on! This entry was posted in Dogs and tagged cleanup, dog walking etiquette, greeting others, kids, leash, walkies. Bookmark the permalink. Dallas! You are absolutely correct, I have missed you very much indeed. What a wonderful spot you have picked to take a rest in that photograph! Such a beautiful picture, it made me smile from ear to ear. These are very wise words indeed and I hope both four legs and two legs pay attention! Mama saved that picture of me onto her phone — it does capture my good side, don’t you think?! Glad it made you smile, Miss Lucy. And thank you for agreeing with my advice — probably nothing a kitty owner needs to worry about, huh?! You look positively stunning, dear Dallas :) Kitties make their own rules, unfortunately – and they can be as rude as they are adorable! Now THAT would be fun, making my own rules! Must take a special kind of servant to cater to a kitty! I laughed at that last bit of advice. Those Yard of the Month folks can be a little obsessive, and it’s hard not to laugh at them getting just a bit of the real world offered up. Otherwise? Good advice, all around. And for us non-dog-owners, I’d only add: always ask the person on the other end of the leash if it’s ok to pet the pooch, before making a move to do so. It’s not only polite, it can prevent a little nervous snapping on the part of the pup. Well, Miss Linda, it’s like I’ve always thought — why go in a hayfield when one can go on pristine grass?!! And if I can see the owners outside weeding, or peering out their windows as I walk past, well, so much the better!! You’re spot on, though, about the advice to ask before touching a pooch. Once, Mama and I were walking, and a man with a ragged German Shepherd dog wanted to let his dog “be friends.” Well, the minute we got close, that beast snarled, growled, and if Mama hadn’t yanked me away, he’d have taken my furry head clean off!! Hahaha. Dallas all good points, I must admit. Except the scooping part. Professors don’t do that sort of thing, see. Mr. Professor, Sir, you probably have servants do that sort of thing. We dogs who walk in town have to have our owners do it — and woe betide those who don’t!! HaHa, Tommy and Tuppence, y’all are just so cute! I’m sure we’d get along famously! Perhaps you can record your servant when she’s scooping and send me a sound bite — bet she uses some of the same words Mama does, especially if I hunker over on the Yard of the Month. You ought to see her drag me off when I do that! I need to post this in my neighborhood! Ah, poor Miss DD. You mean there are other neighborhoods where dog owners don’t scoop?? That’s just nasty, you know, especially when some dogs (not me. I’d never do that) go on the sidewalk! All good advice. So many humans have something missing especially on the scoop part. They do indeed, Mr. John. I suppose it’s not pleasant having to pick up “waste,” but we dogs can’t do it. Mama, I know, isn’t especially fond of scooping something “fresh out of the dog,” but she does it. Me? I’d prefer that my little gifts are treasured where they lie! OUTSTANDING post, Dallas! You GO, boy! And you are so right about everything on your list. I especially like #4 because doggies have a “personal space” just like humans and they should be respected. Why on earth would someone just walk up to a strange dog and proceed to pet it without first asking if it’s okay is beyond me. And these are the same people who complain about getting bit when they shouldn’t have just walked up and touched the dog. And OMG…that photograph of you is BEYOND adorable. You are perhaps the MOST cutest dog in the whole wide world. Great post, buddy. And please tell Mama I said hello! Mr. Ron, I’m glad you mentioned that “personal space.” Some dogs are like some people and need a bigger space than others. Mostly, I try to be friendly, but it’s really best if people ask Mama before messing with me. I haven’t bit anyone…yet! Isn’t that Magnolia tree beautiful? When Mama saw it had dropped all its blooms, almost at once, and no one had raked or mowed them, she just had to snap my picture. They almost look like pink and white blossoms of snow! 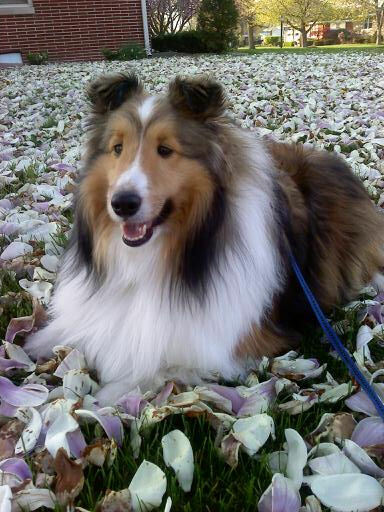 Dallas, I love that picture of you on the blossom petals. You look amazing! And thank you for posting these very important rules. I hope all dog owners take heed! I am often alarmed by how many people come up to my dogs and assume they can pet them. They haven’t bitten a soul yet, but like you said, there’s always a first time and that concerns me. Some people ask though and I applaud them. Anyway, good job, kiddo! Why, thank YOU, Miss Monica. I know Sir Henry and Little Oliver share my thoughts about strangers getting up in our faces. People wouldn’t do that to another person; why they feel at ease doing so to a dog is beyond me. When they ask, Mama usually turns me around so they have to stroke my back — and they’re far away from my face! Most of the dog owners I know are very thoughtful but these are all good reminders. City people are expected to scoop and curb their pups. And may I say you are looking very handsome this spring! Why, thank you, Miss Katybeth! Mama told me this post was preaching to the choir, but on the off-chance someone has gotten a new pup (or forgotten how to do walkies! ), it’s here anyway. Lovely compliment — glad you can’t see the blush underneath all my furs!! Dallas, I have missed you and your Mama. You’re looking fine. I’m so happy to see your furry face and your walkie tips are a great reminder to us doggie owners. Thank you! We’ve missed you, too, Miss Kathy, and hope everything’s well in your world! I love preaching to the choir ‘cos I’m pretty sure all the doggie walkers on this blog already know these tips!